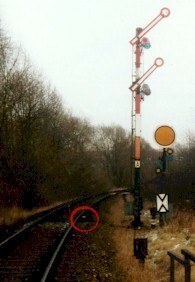 A semaphore signal at Bad Doberan (former DR area) at Hp 0: stop. The signal is equipped with gas lanterns. The black board with the white spots mounted to the lower part of the post is a Zs 103 (Rautentafel/Diamond Board). Another semaphore signal in DR area. At the lower portion of the post you can see a Zs 103 Rautentafel. 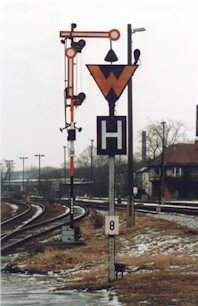 In front you see an orange "W" (a Ra 11a waiting sign) equipped with two lamps (upper right and below) for the Ra 12 signal. Below there is a So 8 Halt Board. 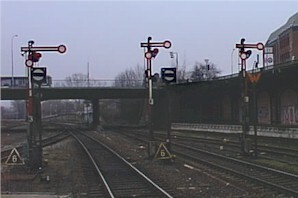 Two semaphore signals seen from the rear side. Semaphores at Lübeck Hbf. Also you see high Sh 0 line-close (shunting) signals (Gleissperrsignale). The triangles below are Zs 3 speed signals. 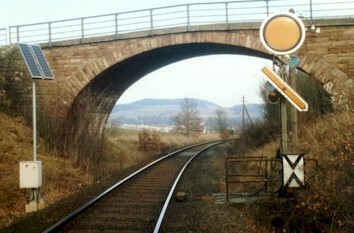 To the right, instead of a Gleissperrsignal a Ra 11 waiting signal is used. 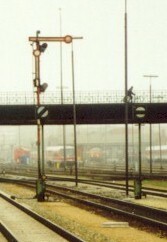 When the line from Hamburg becomes electrified in some years, the wire-operated semaphores will go away. 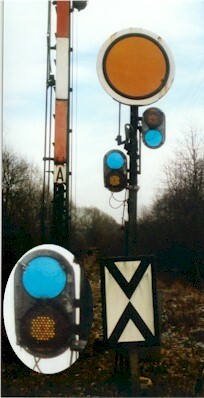 The main signal shows Hp 0: stop for train movements, the shunting signal shows Sh 1: shunting allowed. The red circle marks the position of the 2000 Hz Indusi magnet. A closer look on the distant signal: Recently (as of 2001), all gas and petroleum lamps have been replaced by solar driven LEDs (see inset). Since this signal does not have the arrow-shaped wing, it is a two-aspect signal, capable of showing expect stop, expect clear, but not expect slow. Another solar-lit distant signal (at Vr 2: expect slow). 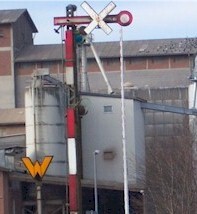 The wing's white/yellow colour identifies this as a western-style (DB) signal, a DR signal would have a red/white wing. To the right of the right rail, you see the 1000 Hz Indusi magnet. 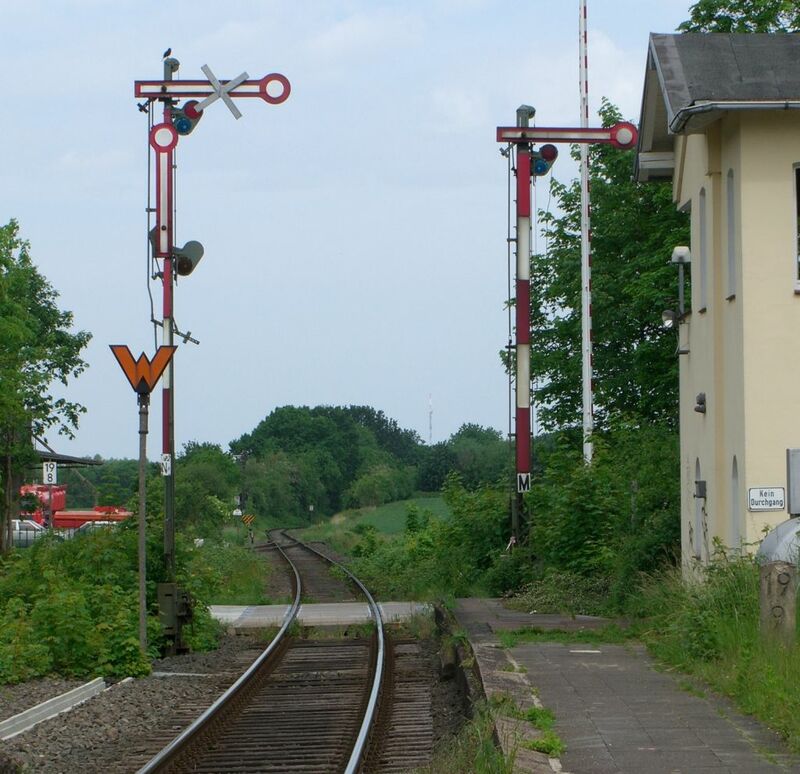 Out-of-use semaphores in Ratzeburg. 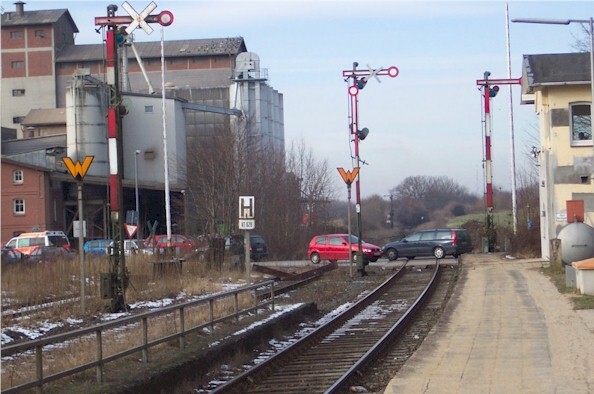 On the large picture you see next to the left two semaphores a "W"-shaped Ra 11 Waiting Signs.